Steve Craig received his undergraduate degrees (B.S. in Chemistry, A.B. in Math) from Duke in 1991. After a year at Cambridge (M. Phil. 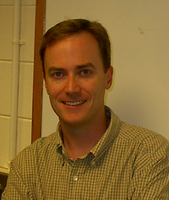 ), he began doctoral work at Stanford, where he received his Ph.D. in 1997. Following his Ph.D., he took a position as a Research Chemist in DuPont Central Research until early 1999, when he moved to a postdoctoral position at The Scripps Research Institute. In 2000, he joined the Department of Chemistry and the Center for Biologically Inspired Materials and Material Systems at Duke, where he is now the Fuchsberg-Levine Family Associate Professor of Chemistry. Our research interests bridge synthetic organic, physical, and materials chemistry. A primary theme is that of the rational, molecular design of materials — using the principles of physical organic and/or supramolecular chemistry to develop new materials. Current interests include using chemistry to guide the design and synthesis of stress-responsive and self-healing polymers and using new polymer architectures as a mechanism to create new reactivity and catalysts through mechanochemical coupling.